Mulu has the largest and some of the longest cave systems found anywhere in the world. Combine this with the very wide diversity of forest types and different altitudes found in Mulu and the range of habitats becomes very large indeed. 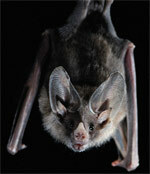 As a result Mulu World Heritage Area is home to 30 different species of bats. In Deer Cave alone, the largest cave passage in the World, there are 12 species of bats including the spectacularly large colony of 3 million Wrinkled-lipped bats. This large community of bats live, sleep, mate and have their babies in the cave and can be seen most evenings streaming out of the cave entrance and spiraling high into the night sky in search of insects. Using 5 special cameras and infra-red lighting (which cannot be seen by the bats) Mulu Bat-Cam is a world first in bringing 'live' vision of tropical cave habitats to Park visitors. No where else in the World can you watch millions of bats deep inside a cave un-disturbed by humans, grooming, squabbling and maneuvering through the inky darkness of the cave using 'echo-location' the amazing ability to use sound to navigate and hunt for food. See amazing images of large unusual cave insects living in total darkness that no longer have eye-sight but have evolved long feelers to search for their food. As the bats prepare to leave the cave, Mossy Swiftlets that have been out feeding in the forest all day are returning in their thousands. Both swiftlets and bats use echolocation not only to avoid hitting the cave formations and walls but also to stop mid air collisions.